Last year I posted a method on how to change Intel Graphic to 60Hz refresh rate, because 40Hz refresh rate sometime can make our eyes very tired after long hours of looking at it. The above method however is not permanent and Intel Graphic and Media Control Panel will eventually automatically change 60Hz refresh rate back to 40Hz. At some forum, someone explained that this is method of slowing down the refresh rate to 40Hz is to reduce the power usage, therefore prolong the battery life. However I don't find it much different with the battery life with both setting. The biggest different with battery life is turning on the WiFi. 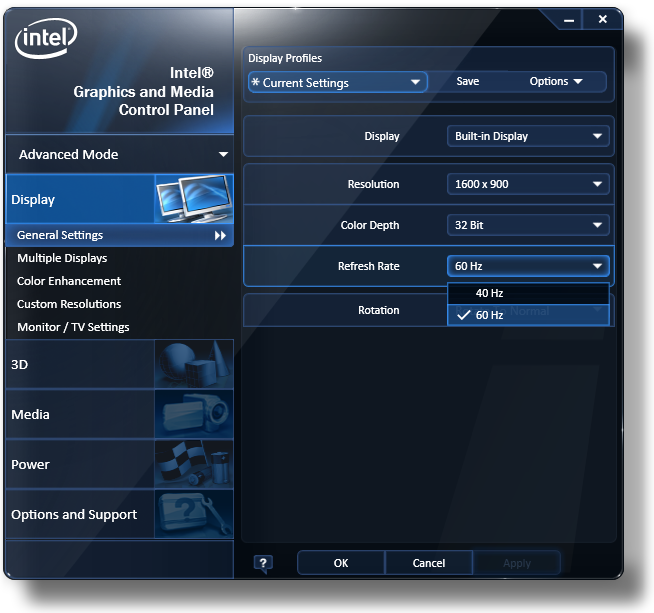 So what can I do to disable the Intel Graphic and Media Control Panel that automatically reduced refresh rate to 40Hz? Open Registry Editor by typing "regedit" with the double quote in the "Search Program and Files" box after click the Windows button. Click Yes if UAC ask the usual question. Now hit Ctrl+F or select find from the edit menu. When you find it, change whatever it currently is to f840 (as hex) or 63552(decimal). Close Registry Editor and restart. You should noticed that the refresh rate on Intel Graphics and Media Control Panel is always stick with 60Hz refresh rate. Warning: editing registry can be harmful to Windows OS. Please be extra careful, and backup the Windows via Windows Restore or other backup system you use. I am not responsible if your Windows behave strangely or crash due to this registry hacking. Thanks for posting this - I replaced the TFT panel in my X220 with an IPS one and it flickers at 50hz (default) but not 60Hz so this saves a major annoyance! Find The Best Smartphone: bias or without?